Live Theme is one of those rareities in the WordPress world. While there are often themes that might have a picture or a header that is dedicated to showing off your “live event”, we haven’t seen a theme that is wholly ingrained with the idea of showcasing your stream. Built with love by the team over at 8Bit, Live Theme is built on the world-class Standard Theme which we’ve written about before. On top of having a really slick look, the theme has some great features which we think you’ll dig. As is common for Standard Theme-based themes, you’ll have the massively powerful back end, as well. Ad integration, social sharing, backgrounds and just about anything else you can imagine are all built right into Live Theme, allowing you an exemplary level of control over how your site looks. Now, here’s the part you need to know: Live Theme is a premium WordPress theme with GPL licensing. As such, this much function comes with a price. It will run you $99 for a standard license. You can step up to a full support license for $149 which will give you access to the Standard Theme support forums, monthly stylesheet downloads and much more. If you want to recoup some of that cash, however, there is an affiliate program for both Standard Theme and Live Theme. 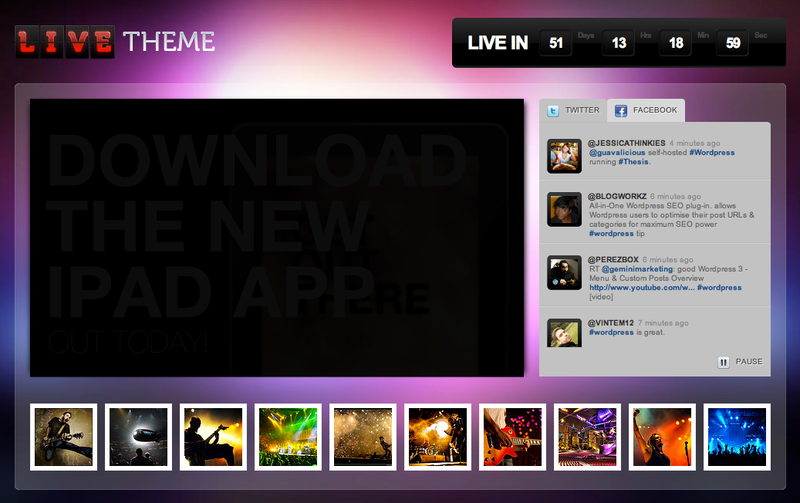 With either purchase, you can use Live Theme on any site that you own. Standard Theme, and therefore Live Theme, have some elements that you generally don’t find in WordPress themes. First off, it validates out of the box. It also has native elements that help to improve SEO and it has baked-in plugins that help it to load incredibly fast. These are all parts that make Google stand up and take notice. Here’s the part where I’ll give you both my recommendation and my disclosure rolled into one. I can personally vouch for the power of Standard Theme in both its use and ability to drive up your Google ranking. Being properly formatted, out of the box, it not only looks good but it works incredibly well. I use it on two of my personal sites and couldn’t be happier with it. I can only imagine that the experience with Live Theme will be equally as rewarding. Read next: Ping and Twitter: Who gets paid and how?